As technology makes it easier to connect and engage with brands, do customer expectations change? And how do these changes impact trust? This trinity of factors is the subject of a new report from Salesforce Research. In their 2018 “State of the Connected Customer” report, Salesforce Research surveyed over 6,700 consumers and business buyers worldwide and analyzed both B2B and B2C attitudes across these three areas. 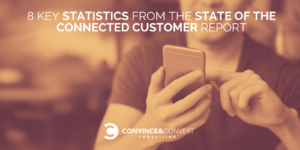 While the findings aren’t necessarily surprising when taken individually, together they form a narrative that indicates that customer loyalty is more fickle than ever, and customer expectations are at an all-time high. Let’s take a look at 8 key statistics from this report that help to bring this story to life. 1. 4 out of 5 customers say that the experience a company provides is as important as its products and services. Let’s start with the obvious stuff—this first statistic shouldn’t be a surprise. After all, there are more brands than ever before in just about any business sector you can think of. (Seriously, how many different companies offer meal kits now?!) Therefore, product/service features aren’t enough to differentiate, and businesses must look to customer experience to demonstrate their brand value and augment their brand perception in the eyes of their customers. Another number that shouldn’t surprise anyone: 84% of customers say “being treated like a person, not a number” is very important to winning their business. It should go without saying the customers want to be respected and valued—simple, right? And yet, the following numbers, indicate that businesses have a long way to go. 2. Half of those surveyed say that most companies fall short of their expectations for great experiences. If 20% of our customers make up 80% of our revenue (according to the Pareto principle), customer retention—through meeting customer expectations—is absolutely key to increasing customer lifetime value. 3. Just over 3/4 of customers say it’s easier than ever to take their business elsewhere. We shouldn’t be surprised that, in an environment in which expectations are high and the quality of experiences don’t meet expectations, customers aren’t particularly loyal. But it’s not necessarily that customers have champagne tastes on seltzer budgets. A full 67% actually indicate that they are willing to spend more for higher quality experiences. They can offer different levels of service and allow customers to make those decisions for themselves. If the airline industry is any indication, however, unbundling services may just create more unhappiness by nickel-and-diming customer experience. As my friend and colleague Jeanne Bliss says in her latest book, “Would You Do That to Your Mother?,” companies should look to turn “gotcha!” moments—in which customers are disappointed by added fees—into “we’ve got your back” moments—in which companies exceed expectations and go the extra mile to make customers feel valued. 4. 72% say they share good experiences, while 62% say they share bad experiences with others. Word-of-mouth can work both for and against your company. What do your customers say about you and what are you doing to influence their conversations? With such high percentages of customers indicating that both good and bad experiences spawn chatter, companies must have proactive strategies to address WOM. 5. 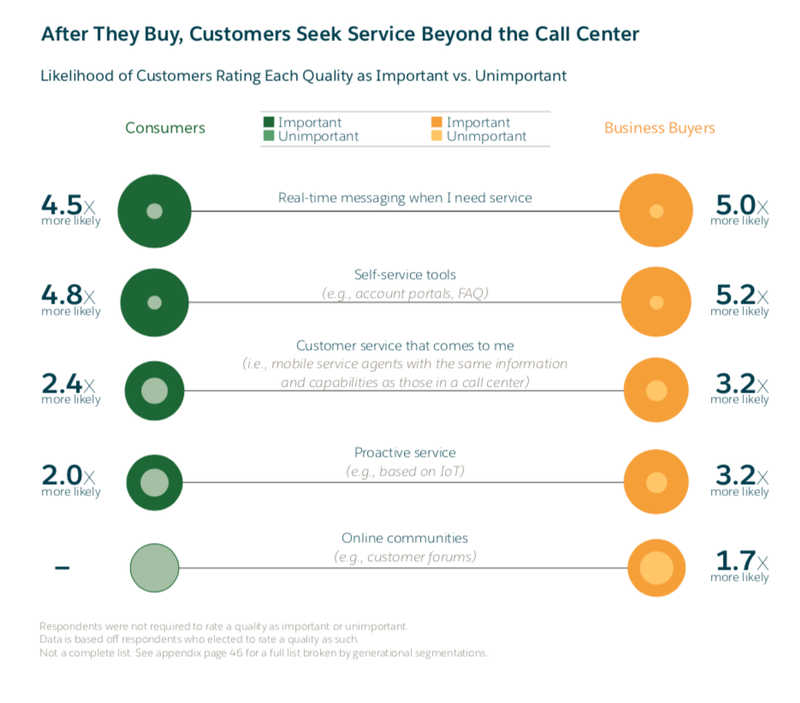 B2C customer experience is setting the standards for the B2B space too. According to the report, 82% of business buyers “want the same experience as when they’re buying for themselves” (as B2C consumers). Once again, big B2C brands are setting the standards, with 69% of B2B buyers saying that they expect “Amazon-like buying experiences” that are tailored to their prior engagements. As an analyst for Convince & Convert, I work with some of the biggest brands in the world, and I often have conversations with B2B brand marketers who are only looking at their competitive set and what they bring to the table. The thing is, your customers aren’t doing that. They’re comparing your customer experience to every other customer experience they have on a daily basis. Can your brand live up to it? Not only are B2B buyers looking for strong customer experiences, but almost 3/4 of B2B buyers expect vendors to personalize experiences to their needs. 6. In fact, personalization matters across the board. For both B2C and B2B interactions, personalization is preferred by customers. You may have heard that customers don’t like the uncanny nature of tracking across different websites and experiences, and I agree that marketers must be aware of respecting customers’ privacy and setting expectations. But AI-driven recommendations for content, products, and even knowledge-base information increases satisfaction by making it easier for customers to find and discover resources they find valuable. Looking for a place to start? Segment your email list by personas or interest areas and use automation and rules to showcase specific content and/or products for each audience group. 7. 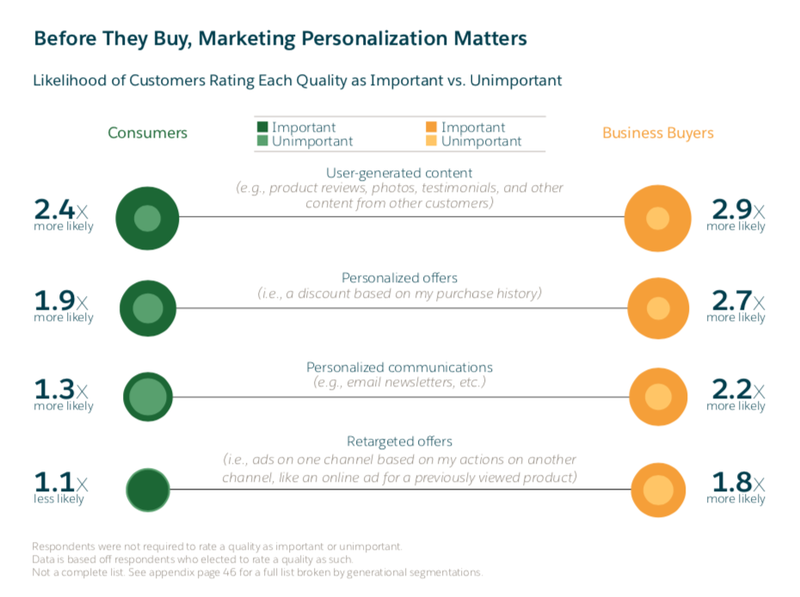 After-purchase personalization is important too. In fact, it’s the little things that make a difference: don’t make customers repeat themselves and be sure to address them based on previous interactions. For instance, recently, I hopped on Amazon’s customer service chat, and I was pleased that it welcomed me back. The chatbot recognized that I had previously used the technology, and customized its responses accordingly. This ties back to the finding that people want to be seen as individuals and not just numbers. 8. 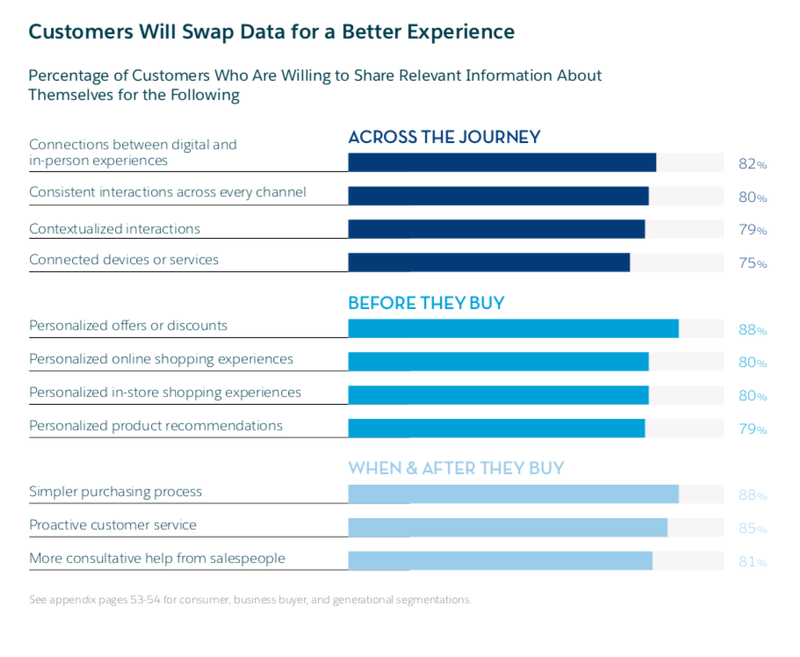 Customers will share their data to get a better experience. Finally, I think it’s extremely telling that “79% of customers are willing to share relevant information about themselves in exchange for contextualized interactions in which they’re immediately known and understood.” At a time when data privacy is an ongoing and evolving conversation, brands should recognize that customers are happy to provide information when it immediately and clearly benefits them. As your company thinks about how it collects and uses data, be sure that the benefits to the customer are clearly articulated and defined. Demonstrate to customers how their experiences will be made better. Review your customer experience throughout the steps of your customer journey. Are you addressing their pain points, their needs, and their motivations? Are you making it easy to get help as needed? Do you provide WOM-worthy experiences? Look at how you’re collecting data. How are you using that information? Is it the right data to provide more personalized experiences for your customers? Audit your points of personalization. Do you empower your sales and customer service teams to have personalized interactions with customers? Do you serve custom content on your website, in emails, and through advertising? This self-assessment is the first step to understanding how your company is addressing the changing expectations of customers. Ready for the next steps? We work with the world’s most interesting brands—let us help you build your plan of action.